The construction bid process may be the most important aspect of the industry. 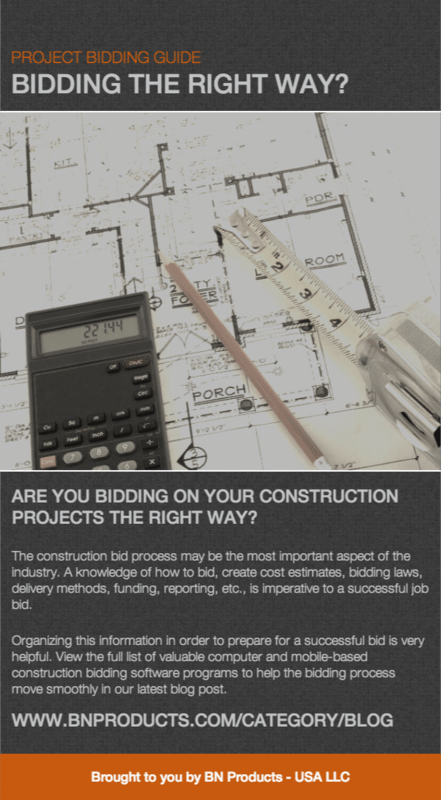 A knowledge of how to bid and create cost estimates, as well as bidding laws, delivery methods, funding, reporting, etc., is imperative to a successful construction job bid. Organizing this information in order to prepare for a successful bid is very helpful. Below is a list of valuable computer and mobile-based construction bidding software programs to help your bidding process move smoothly. HardDollar: enterprise-level construction estimating software that is also a complete project management system and regards civil and high-dollar projects. This software streamlines the process of creating the big and tracking it in such a way that reduces errors. Estimate Master: known for its detailed database and automatic saving features which allows users to pull in previous information when creating new bids. Also a complete construction software, though it does not have a scheduling tool. SmartBidNet: A private web-based construction bid management process software for general contractors that keeps data online and is accessible via a computer, tablet or mobile device. Best Bid Electrical Estimating: a speciality software that is affordable and user-friendly and focuses on estimates for commercial and residential projects. B2W Estimate, Estimating & Bidding: estimating software for medium to large companies regarding special areas such as paving and concrete. ConEst IntelliBid: and estimating system used all over the world for both commercial and residential contractors in the electricity industry. Construction Cost Estimator App: an easy app for Apple and Android users that will create on-site and remote cost estimates. SmartBidNet: the recommended software also has a convenient app for Apple products that will help you manage your bids. Tradies App: includes mini apps to control features such as site information, orders, inventory, quotes and of course, bids. Bidding laws vary per state. Make sure to contact a lawyer within that state or find public contract documents with laws regarding bidding eligibility and competition regulations. Many states prefer residents over outsiders for construction projects, meaning a license must be obtained. The U.S. Davis-Bacon Act federal law mandates that contractors and subcontractors must pay local prevailing wages and benefits on construction projects (public or private) negotiated to receive federal funding over $2,000.